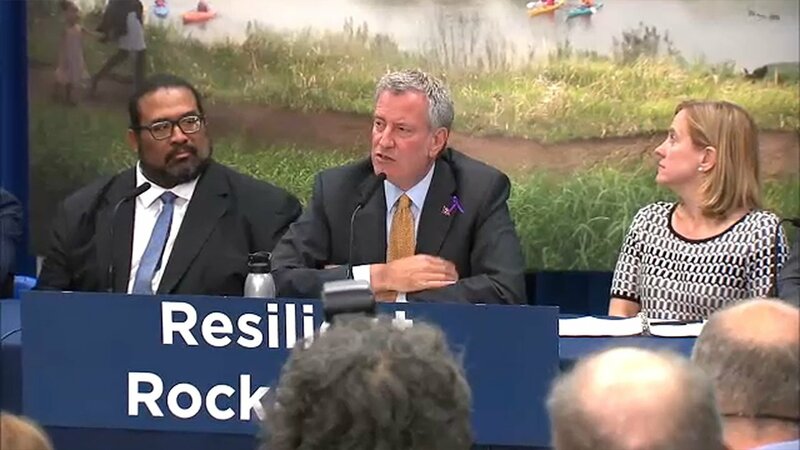 ROCKAWAY BEACH, Queens (WABC) -- On the 5th Anniversary of Superstorm Sandy on Sunday, Mayor Bill de Blasio announced a $145 million investment for up to seven resilience projects to help protect communities in the Rockaways from the impacts of climate change. Each project will be designed to improve quality of life, build more resilient neighborhoods in the Rockaway peninsula that will be better prepared to withstand future flooding and coastal storms. "These investments are an important step forward for Rockaways residents, connecting them with parks and the waterfront, while helping shield them from future storms," Mayor de Blasio said. With FEMA's approval, the City will now be able to complete design on following seven projects, moving them another step closer to construction, subject to final FEMA approval. - Bayswater Park: This project will install berm along the waterfront and other feature to help manage stormwater. It will also include new sports fields, play areas, a public plaza, a refurbished comfort station and access for kayaks. - Edgemere Raised Shoreline: This project will raise the shoreline around the Edgemere neighborhood. It will include new vegetated berm and new bulkheads to help mitigate coastal flooding. - Shore Front Parkway Recreation Zone: This project will include six new recreational facilities along Shorefront Parkway to replace those lost during Hurricane Sandy. - Rockaway Community Park: This project will include a raising the shorelines around the parks' eastern and western edges as well as restore the native wetlands as a natural buffer between the park and Jamaica Bay. - Beach 88th Street Park: This new waterfront park will include a new seawall and restores wetlands to mitigate against tidal flooding in the Rockaway Beach neighborhood. It will also include play and seating areas and kayak access. - Thursby Basin Park: This project will transform a vacant lot into a park with seawall and new resilient vegetation along the water to help protect against tidal flooding. It will also include new sport courts, play equipment, and a kayak launch. - NYC Parks' Operations Headquarters for the Rockaways and Broad Channel: This project will elevate past of the facility protect from future flooding to ensure it can as a response center in the event of a future storm. Public scoping meetings to begin these projects are expected to be held starting in Spring and Summer 2018. To see the full list of the City's progress on its OneNYC $20 billion multi-layered resiliency program, please visit the citywide resiliency map HERE.